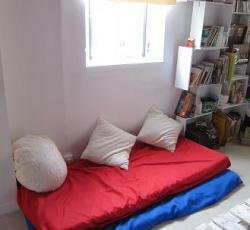 We are a local Hong Kong house stay hostel located at the center of Hong Kong. Safe, easy and instant online bookings powered by . Lowest prices, no booking fees. If you find Backpackers Heaven Tin Tong at a lower rate somewhere else after you have booked, we will refund you the difference. This really is a true backpacker hostel! No frills, but it really has everything you might need. The property owner is very friendly, and was glad to hang out on the roof drinking a beer with me! I didn&'t think the location was bad either. There is a subway station right on the same street, so unless you get back late right after the subways stop you shouldn&'t have a problem at all. Some people told me the region wasn&'t very good, but I never felt unsafe. Just be smart and don&'t go wandering around by yourself at night. The same is true for any place. Over all it was a great stay, and also the significant room is very contemporary and cosy. A excellent location for the backpacker&'s experience. The location was off the beaten path in an region exactly where traveller were less common (Sham Shui Po). 9 floors up with a private rooftop and an outstanding view. The location was small, but created an environment that sparked conversations and friendships with other travelers. NIcholas, the manager, and Peter, one of the longer staying residents, made our stay memorable. We spent each of our days traveling around Hong Kong with them and the other residents seeing the sights, hiking hong kong island, attempting to surf at Big Wave Beach, pub crawling, and much more. I highly recommend Tin Tong for anyone wanting to have a genuinely special encounter whilst in Hong Kong and create lasting memories with wonderful people. Authentic Hong Kong lodging experience! The view from the ninth floor (and even rooftop access) of Sham Shui Po is the stuffs you see in movies, really amazing view of the rustic side of Hong Kong. This is the side of Hong Kong that fascinates travelers - raw and authentic. There are superb food eateries around in Sham Shui Po at the same time - Michelin Star Dim Sum Tim Ho Wan, Sam Kee Wanton Noodles, Dessert stalls, etc. Not forgetting a fantastic interior deco! Thumbs up! I loved the price. Hands down the cheapest hostel I could uncover anywhere near Hong Kong. Although its not located on Hong Kong Island, it is 1 minute walk from the Metro station. Extremely small, max capacity is 8 individuals plus the manager in one room, but straightforward to get to know the other travelers, especially with the common area on the roof. Extremely laid back and chill. It was different then other hostels, you could chill on the roof with a nice view. Everyone was really nice. The place is full of wonder and treasure! Warm welcome, cozy home party beet, Wong Ka Wei film, velvet underground, hammock rock, night sky city light. Will be back again next year. You meet a lot of nice people, clean. Although its not a excellent location, the metrostation is close. Great location to meet fellow backpackers and travellers, really cool and helpful staff, very good beds and compact staying arrangement. Exceptional roof for the common area. * Backpackers Heaven Tin Tong rated 4.56 out of 5 based on 9 customer reviews. Hostel reviews with a star rating are sourced from HostelBookers. If you find Backpackers Heaven Tin Tong with the same booking conditions at a lower rate somewhere else on the internet after you have booked, we will refund you the total difference.